Progyan, Management fest of Sastra School of Management, Thanjore was conquered by the students of DoMS NITT. Out of the 10 events held at the fest, 5 were topped by students of DoMS NITT. These achievements lead to overall trophy to DoMS NITT. Paper presentation competition was won by Anshuman Dutta from MBA II year while Gowthami and Gautam Sai bagged the second prize in the same event. 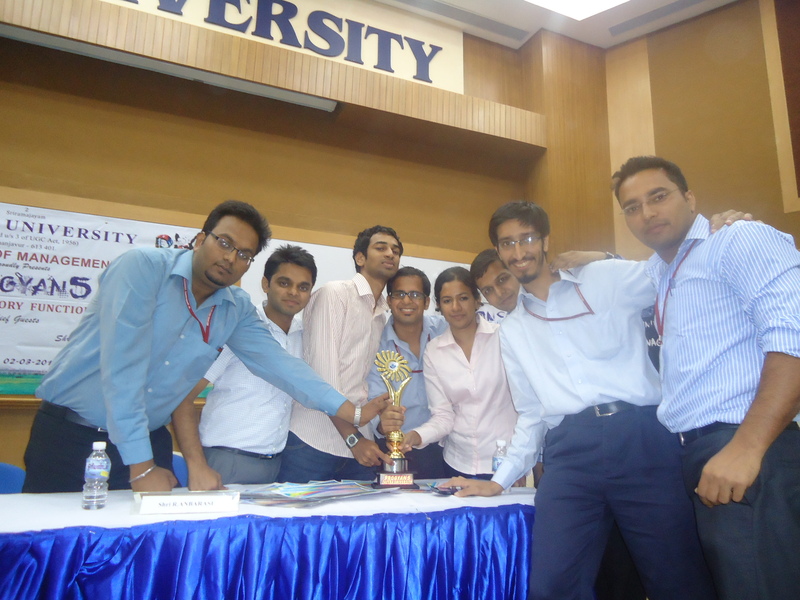 First prize for Best Management team was won by Amitesh Singh Yadav, Amod Garg, Harshit Agrawal and Nitesh Mittal. Quiz competition was won by Gautam sai and Gautami Mohanlal. Spin-a-Yarn, a creativity event, was won by Nitesh Mittal and Amitesh Singh Yadav. The Director of Sastra University congratulated the DoMS team for their performance and also wished them luck for their future endeavors. Posted in Events, General, Management Forum!!! Nuances of Quality Management !!! The students of DoMS were enlightened with the presence of Mr. Manikandan Murugesan, who is currently the Quality head of Nokia. Mr. Murugesan has 13 years of corporate experience including work experience in HAL. 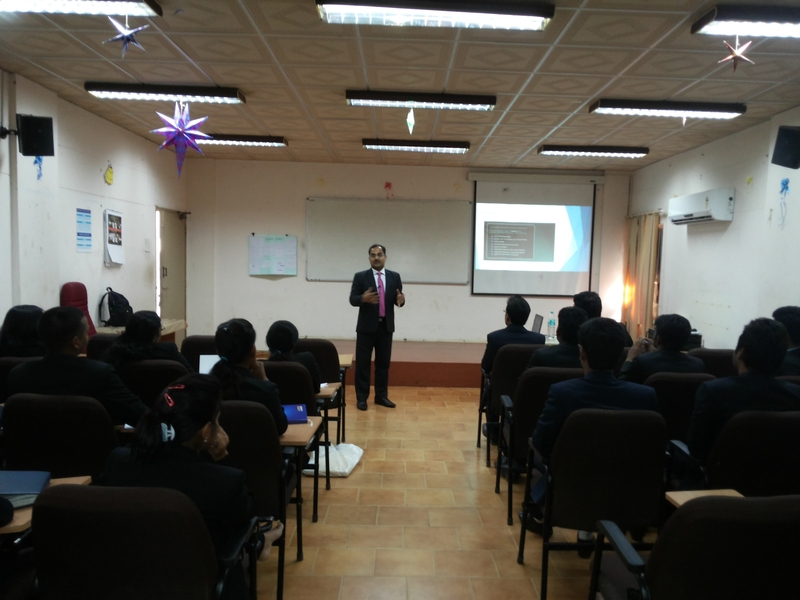 He enriched the students with the fine and minute details associated with quality management in an organization. He talked about the various techniques which were being practiced in earlier times and also about the latest trends undertaken by numerous companies in maintaining the quality of their services. He gave insights about the Lean and Six Sigma. 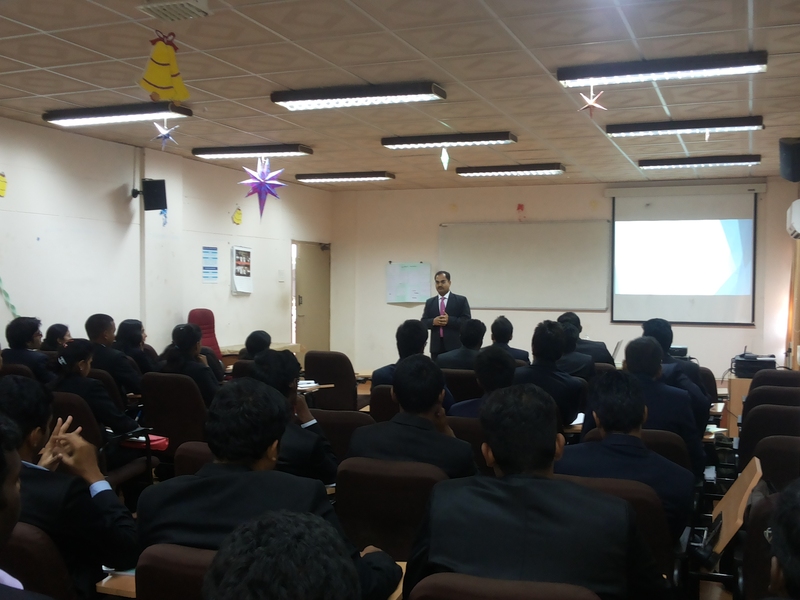 The students were made aware about the history of Lean and Six Sigma and how both the practices have evolved over time. He elaborated about how certain changes such as new competitions, changing stakeholders need and changing basis of competition, trigger the need for adopting these quality management practices. The difference between continual and continuous improvement was conveyed in a very practical way. He emphasized on the different objectives which both Lean and Six Sigma have in improving the various processes qualitatively in a business. He elegantly illustrated how Lean and Six Sigma can make a significant difference to an organization with a practical case study about a tea shop. The way these techniques can be applied to even a small shop in improving the profit, left everybody spellbound. He concluded his session by sharing some of his bitter experiences in industry and advised the students how those situations can be avoided. On the whole the participants gained the practical understanding about the magnitude to which Lean and Six Sigma are serving the industry. An International conference on Strategic Trends on Innovations and Creativity in Management Practices was organized at Anna University on 10th and 11th of September, 2012. The conference was attended by several research scholars from different institutions who presented their papers in their respective domains. More than fifty papers were presented on those two days of conference. Himsagar, a first year student of DoMS NIT-T, presented a paper on Model Development for Brand Loyalty-A case on Men’s Jeans Wear and bagged the first prize for the best paper award in the marketing session. The paper was authored by Dr. G.Muruganantham, Professor at DoMS NIT-T ,and co-authored by Mr. Magesh, an alumnus of DoMS. DoMS has a tradition of students participating in paper presentations and conferences and expects more laurels to come its way, through its diligent students. Entrepreneurship is in the Sessions & Spirit !! 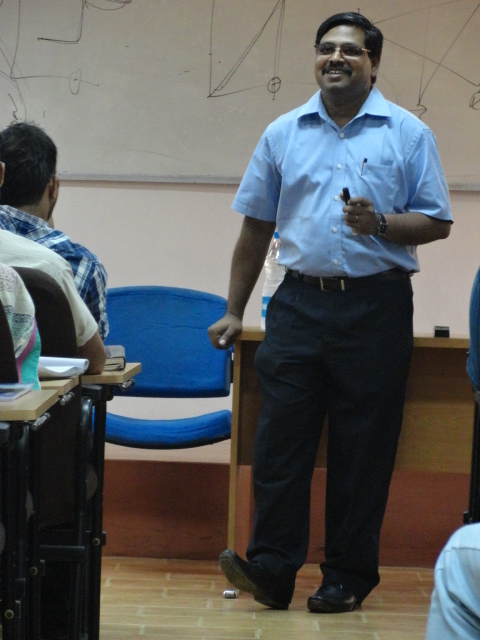 A session on entrepreneurship was organized for the students of NIT Trichy on 17th Sep 2012. Mr. K Ganapathy Subramanian, an alumnus of NIT Trichy, who is also the founder member of StegaCapital addressed the highly participative students. StegaCapital is a firm that provides consultancy services to budding entrepreneurs and its founder was the ideal person for the occasion. He started with some frightening facts quoting that “95 % of the startups fail and the first 3 years of any business is a valley of death”. He later went on to explain the mantras of how to form a team, from where to get the funding for one’s venture, regarding venture capitalists and about the evaluation criteria for funding a project. The presentation dealt with the inside out of all the business hustles and bustles. Besides answering to the questions that were shot at him, he also discussed about how to secure one’s idea and the ways to check the feasibility of one’s business plan. The enlightening session ended up with Mr. Ganapathy encouraging the students to venture into entrepreneurship and find their own footholds in several sectors. IIM Kozhikode Faculty Dr. Joffi Thomas visited Department of Management Studies (DoMS) NIT Trichy. This initiative was taken by DoMS faculty Dr. G. Muruganantham for the betterment of 1st year MBA students. The participants were enlightened on the topic of ‘Essential elements of marketing mix’ through a practical approach with the help of a case study. The famous case study of Vora and Company prepared by Neil H. Borden of Howard University was discussed and analyzed during the lecture. The case study explained the existing conditions and the practices followed by the company. It dealt with the history of the company and its strategies on competition, packaging, distribution, pricing, sales, cost and advertising. The problem stated was that the company was a loss making industry. Then the participants were asked to apply their knowledge in marketing to solve the problem after which Dr. Thomas gave his valuable inputs to the same. Dr. Thomas appreciated the level of involvement and enthusiasm amongst the participants. He also cherished innovative ideas given by them followed by the vote of thanks by Shobhita from the guest lecture committee.